Lentils are a traditional ingredient used to usher in the New Year, purportedly bringing good luck to those who eat it. Whether that is true to not, lentils pack a big punch in flavor and nutrition. You can’t miss when adding this healthy legume to your diet. Click this link to read more about Lentils in the New Year. 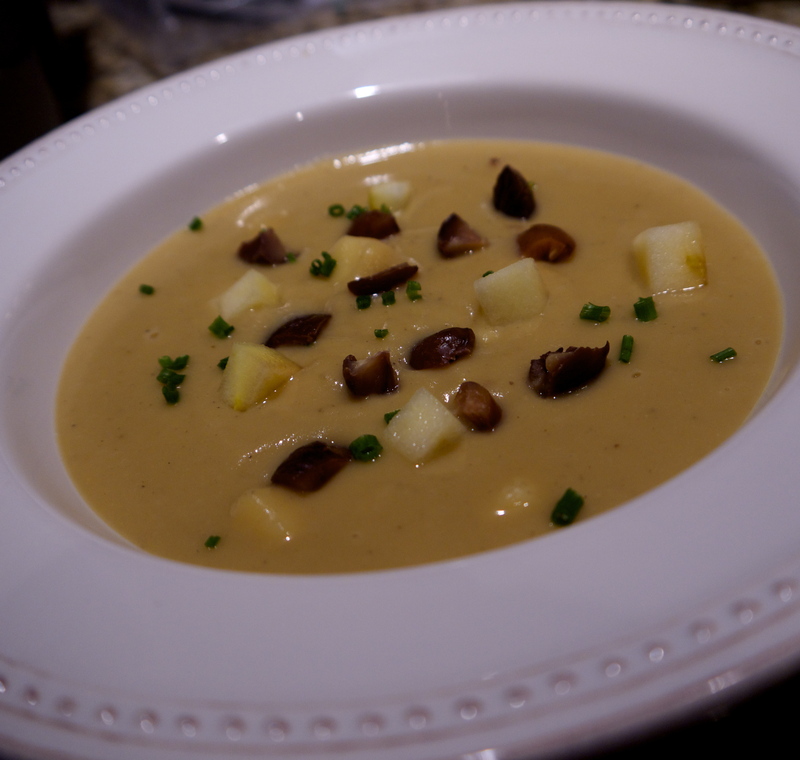 This quick and easy soup is smooth and full bodied with great texture and taste. Over medium heat sauté the shallot and garlic in olive oil. Season with 1/4 teaspoon each of salt and pepper. Cook for about 2-4 minutes until soft. Add the ginger and cardamom and cook for 1 minute. Add 3 cups of stock and cinnamon stick and bring to a low boil. Add the lentils and thyme and reduce the heat to a simmer. Meanwhile peel and chop the apple. Take care to dice 1 cup in nice symmetrical 1/4" cubes and set in a bowl of cold water with the lemon. This will keep the apples from turning brown. Take the rest of the apple and toss it in the soup pot. While the soup finishes cooking roughly chop the chestnuts and slice the chives thinly. Once the lentils are really soft and falling apart, about 10 minutes, remove from heat and allow to cool for 5 minutes. Remove the cinnamon stick and carefully puree in a blender until very smooth. Taste for seasoning and use the last cup of stock to get the consistency you like in soup. Garnish with the chestnuts and chives. You can find roasted peeled chestnuts at many local produce and grocery markets in the area, generally in 3.5 oz bags. One bag will be plenty for this soup, unless you like to nibble on them. In that case I would highly suggest two bags!